Don't be fooled by thinking that training at 100% helps you avoid being lazy. Laziness can creep into your drill selection and the effects can be highly negative on your game. Why? Because sometimes players don't want to choose drills which push them even harder. 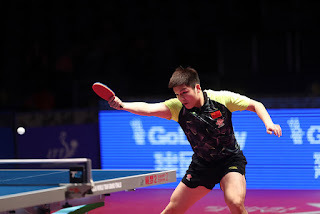 Say your footwork is slow when doing Falkenberg (backhand, pivot-forehand, forehand), but when you do a shorter footwork movement like 2 point forehand you are much more comfortable. Sometimes players will use this as a premise to choose 2 point forehand more frequently. Yes you may fly through the repetitions, you may drip sweat all over the floor and your short footwork may improve, but you are only hurting your advancement in the game by avoiding drills which push you harder. A good example is the three point forehand and the '5' point forehand. One involves hitting a forehand at each line on the table consecutively, the three point on the other hand doesn't include a middle ball on the transition back to the starting forehand. In the training group of elite kids that I am involved with in my club I often give the kids the option of choosing 3 or 5 point forehand. Most kids will opt for the 5 point forehand, the ones who choose the 3 point are the ones who have a higher quality level in both training and matches and generally a better attitude when it comes to challenging themselves. These kids are training hard, no matter which drill they choose, but the ones who pick the 3 point forehand are actively pushing themselves further to improve. A lot of the mentality that leads to choosing the wrong drills is picking those drills that you know you are good at. Maybe you have the best forehand game but your backhand is severely lacking (as a simple example), players may steer away from drills where they are more likely to miss, not find rhythm or make simple errors - areas which they could improve to make them better players. Complacency is part of the problem and keeping a constant level of confidence. It's a simple formula, we miss frequently and our confidence dwindles, we no longer want to continue the drill. This is common, especially among young players. The key to success is - make your weak areas GOOD and your strong areas GREAT. One such weak area which is not commonly practiced is the cross-step, used for covering very long footwork movements. This often results in players not having good movement or balance when pushed wide over a long distance. Think to yourself, when was the last time you practiced cross-step footwork movements? Here are some tips on how to get a more well-rounded perspective on choosing your drills. - Divide Strengths and Weaknesses: Write some notes on your strengths and weaknesses and for each area add a list of potential drills you can do to help improve them. This makes you actively think about the drills you are neglecting. - Allocate Training Time to Weak Areas: If you are going to choose 5 different drills in a training session, be sure to choose 2 which work on your weaker areas. It is common practice to favour your strengths in training but still have a big effort towards working on those areas that are lacking in your game. - Ask Others to Choose Drills: You can take advice on which drills could help you or which areas to work on - ask your coach/es, training partners or other training players in your club or team as to what they think would really help your game. Feedback is an all important part of the cycle of learning and improving. - Try and Add Variety to Your Training: Add many different elements to your training to cover different areas - serve and return, multiball, forehand footwork (focus on different types of footwork: in and out, side to side, long, short, cross-step), some drills focusing on technique, some on tactics, offensive and defensive/passive drills. The more depth you can build into your training the stronger your foundations will be. So those are some things to think about. One area of importance is to regularly assess your training and think of whether it can be improved. Actively think about areas that you may be missing out on in practice or weaknesses which could use more attention. And remember, laziness is not only in actively doing the drills but also in choosing them. Make the best decisions for your game and always remember to keep pushing yourself to new heights! One really can improve their skills if they choose the right experts and I think there are many online websites which can help them. Choosing the right coach can help one achieve his full potential. Being exposed to different drills which are handled by trainors can help an athlete become a better version of himself. Those tips are helpful especially for individuals who prefer doing a routine because they are used to it instead of putting an emphasis on their weak areas. A good training is crucial for beginners. It helps new players improving footwork, reflex and more.